Pumpkins can be used for more than Halloween decorations and holiday pies. Pumpkins are high in zinc, beta carotene, and vitamins A and C -- all associated with achieving and maintaining healthy skin. A pumpkin peel represents an alternative to potentially harsh chemical peels. The pumpkin peel works as a natural exfoliating agent by removing dead skin from your face. While over-the-counter pumpkin peel products are available, you can make your own concoction at home. Mix 1/4 to 1/2 cup of canned pumpkin puree or sliced and blended fresh pumpkin with an egg. Because the mixture should not be stored for later use, it is important not to make too much at a time. 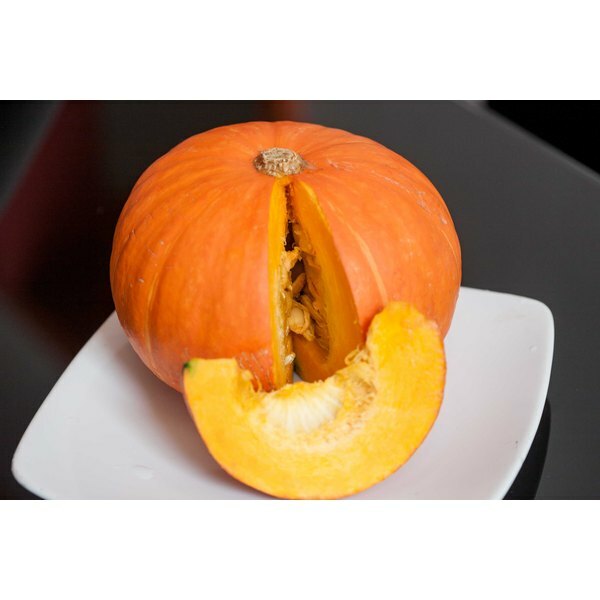 Add additional ingredients to the pumpkin peel mixture based on your skin needs. BellaSugar suggests adding 1 tbsp. of honey for dry skin and about 1/8 cup of cranberry juice apple cider for oily skin. Honey is a natural humectant. Cranberry juice and apple cider have astringent effects. Blend your pumpkin peel mixture, if desired, to obtain a pasty texture. Apply the pumpkin peel to a clean face for 15 minutes. Rinse the peel from your face with warm water and pat dry with a towel. If you are using canned pumpkin, confirm that it is puree and not pie filling. Do not store any leftover mixture. delish: Pumpkin: Should I Eat It — or Wear It?